Are you missing a tooth? Do you have a large space in between two healthy, stable teeth? You may be a good candidate for a dental bridge. A dental bridge is a fixed dental prosthesis that can replace a missing tooth or teeth; this prosthesis joins an artificial tooth (or teeth) to the adjacent, healthy teeth on either side of the missing space. 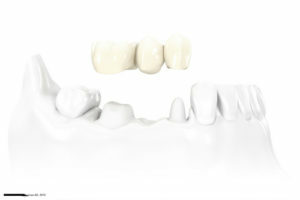 In most cases, the natural teeth (abutment teeth) have to be reduced in size in order to allow a bridge to fit on them. When assessing your mouth to decide if you would be a good candidate for a bridge, Dr. Street will evaluate the abutment teeth to make sure that they are free of decay and periodontal disease. If one of these teeth has decay, a dental filling may be required to build up the missing tooth structure so that the tooth could support a bridge. Periodontal disease (sometimes referred to as “gum disease”) is the infection of the supporting structures of the teeth. If left untreated, periodontal disease can cause loss of more and more bone around the tooth. Eventually, this can lead to tooth mobility and tooth loss. Any active periodontal disease will have to be treated first before placing a bridge. If one or both of the adjacent teeth are even slightly mobile (loose), then they would likely not be good candidates to support a dental bridge. The bridge should always be designed so that a patient can thread floss under the artificial tooth and maintain great hygiene around the natural teeth. The bridge is also designed to provide optimal esthetics so that the artificial tooth looks natural as it makes contact with the gums. It is important to note that there is typically more than one option available to fill a missing tooth space when adjacent teeth are present. Dental implants and removable partial dentures may both be alternative treatments for the patient. All three treatment options (including bridges) have their advantages and disadvantages. Also, one particular treatment option that may work well for one patient might not be the best option for another. Dr. Street will gladly answer any questions you may have when choosing the right treatment to fill in a space.